Rudraprayag, a town named after Lord Rudra (Shiva) is a significant tourist spot for the devoted souls. An important stopover of the celebrated Hindu Pilgrimage Badrinath, Rudraprayag also ranks high as a popular getaway. Folks looking for a break from their mundane life can get ultimate peace roaming around the age old temples, Ganga Ghaat and especially the confluence of Alakananda and Mandakini River. To make your stay comfortable in such a wonderful place, Hotel Monal Resort is built with exclusive architectural design amidst picturesque setting. Located on the highway to Badrinath at a distance of 3 km from Rudraprayag, this resort is the only luxurious accommodation in Rudraprayag. The central abode of this resort is found amidst an exotic ambiance with regal architectural touch. The hotel serves the requirement of guests who want nothing but the best services and facilities. The grand vistas of the magnificent Garhwal Himalayas rich in splash greenery is a must see sight on a refreshing morning after enjoying a deep slumber at night. The attached balcony or sit out area close to the rooms are ideal for having a sip of coffee or for spending some private moments with your beloved. People looking for comfort along with peace can always head here to spend some soothing time during their holidays. 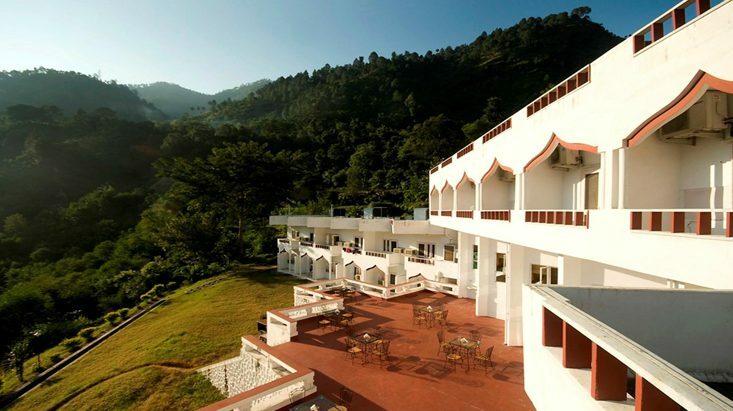 The resort comprises 52 air-conditioned rooms including Maharani and Maharaja Suites. The ambiance of each accommodation is distinct and allows the guests experience a lavish stay. To meet the needs of guests who are very specific about their stay, the resort brings accommodations with astounding facilities. As per the budget the rooms are given different names such as Premium rooms, Deluxe Rooms and Standard Rooms. Each accommodation is set with a close balcony offering breathtaking views of the serpentine Alakananda River. In-room amenities like television, intercom and telephone make night stay more convenient. Attached bathroom has running hot and cold water. Rudraprayag is a much needed halt for the tourists embarking towards Badrinath. To offer them ultimate comfort the resort has introduced exclusive amusement options. The resort has an in-house multicuisine restaurant called ‘Turant’ which offers a wide range of scrumptious dishes. Those who want to have food in open space can go to the open air restaurant located inside the hotel. The restaurant is built amidst sprawling lawns and lets one enjoy the food witnessing the wonderful scenic ambiance. The resort vicinity includes a beautiful Japanese Garden which looks unbelievably exclusive in its overall setting. The trees in this garden are trimmed and manicured artistically to bring verve to its overall look. The garden is designed with jogging track and let one go for a refreshing morning walk enjoying the fresh breeze. Families with kids can take their little ones to the spacious children playground or can let them float in its shallow pond joining paddle boating. For your spirited kids, availability of amusement options is a must. Considering the needs of modern days’ children, the resort is attached to an open playground where they can have enough fun. For boating, the small pond serves as an exclusive option. Colorful fountain and an artificial waterfall amuse kids and enhance the exclusivity of its quixotic ambiance. Alakananda-Mandakini confluence is a must-see sight which is very close to the Monal Resort. The nearby attractions to this hotel are mostly temples built with exclusive design. Some of the important temples are Bhagwan Rudranath Temple, Chamunda Devi Temple, Narad Temple, Koteshwar Mahadeva Temple and some more. Bhairav Mandir is at a distance of around 10.5 km. Dangi Jungle is a forest located at a distance of around 9 km from the hotel.